If you aim to find the best project planning software and tools for your work or business, you have a couple of things to consider. For example, think about: Do you use Agile or Waterfall methodology? Do you need online a cloud-based software with visual mobile apps or one for MAC/Linux system? Premium or free planning manager tools? Will it be a specialized one such as construction or IT project planning system? Large or small business needs it have to cover and etc. What is project planning software? It is nothing more but a PM software with a focus on planning. I mean it might have other useful features but the planning ones are the best in the industry. A list of the top project planning tools and systems. Top free project manager software for planning. Quick tips and guide how to choose the best software for plans. Infographic in PDF for free download. Project Planning Software. Some of the Best. If you aim to save a lot of time by automated scheduling and planning, LiquidPlanner could be the answer. It is easy enough to be used by project managers and by people who do not know much about project management. Schedule multiple projects, track time, assign tasks and monitor progress in one central location. Fast and easy and the most important – predictive project planning software. You can alleviate risks early because you are able to instantly see the impact of changing priorities and their effects on delivery dates. Excellent time tracking features and an accurate prediction of when work will be completed based on priority and allocated resources. LiquidPlanner is ideal for teams who want the scheduling capabilities of sophisticated project software but need a simple, easy-to-use tool that everyone can access. If you need a project planning tool with a solid place for employees to work together, Wrike can be the best for your business. It’s pretty self-explanatory with an easy to use and intuitive design. Very quick to set up and requires little or no training to use. Wrike has the ability to combine project planning with a huge workspace for discussion, and ultimately team collaboration. Suitable for all size of companies – mid-size, small businesses and enterprises. Pretty much integrates with everything so you can use all of your business tools in one place. You have anything you need to complete your project and to finish your planning in one spot. When we talk about easy to use project planning software, Planio definitely is one of the best examples. Planio is a platform for online project management that makes planning and collaboration more effective. Simple but with a lot of powerful features. A configurable task management app that features portability, planning tool integration, and intuitive workflow handling. From the powerful role-based permissions system to Project Manager-friendly planning tools (workflows, roadmaps, and milestones), Planio’s task management functionality is easy to use yet powerful enough to handle projects of any size. Key features: Manage Tasks & Workflows, Agile and traditional project management, Collaborative File Management, Communications via blogs, forums and comments, Repository Hosting, Knowledge Management, Team Chat, Mobile and more. Easy Projects is a cloud-based project planning software with tools tailor-made for easy planning and execution. This software is a choice of companies from small and medium businesses to large scale enterprises. Through time-savers like Gantt chart, Resource Loading Simulations, and Project Calendar, you can manage your team and tasks in minutes. The software comes with a number of templates for IT, Marketing, Engineering and other types of projects. You can also create your own project templates. Resource Planning and Management that include Resource Loading Report, Resource Loading Simulation, Calendar, communication via a single real-time collaborative interface and more. You can import your data directly into Easy Projects from Excel or MS Project, synchronize with different applications, and use the API to integrate with your existing systems or applications. When it come to simplifying and automated project planning for managers, Comindware Project has a lot to get. A very powerful project management tool with Gantt charts, work breakdown structure, automated project planning and very simple and easy to use interface. Some of the most innovative online planning tools that allow you to better manage your resources. Emphasizes better collaboration and project planning through its Work Breakdown Structure. One of the most important things – with a simple drag-and-drop function, your project start planning itself. Intuitive project tracking that enables team members to calculate realistic deadlines by tracking the actual task completion progress. If you are searching for a software for improving project planning and providing your team with a central hub for task management, Redbooth can do it. Very valuable planner for companies with remote workers because some of Redbooth provides some of the most advanced collaborative features in the industry. For better planning you can gain valuable insights into team performance – evaluate trends, strategically allocate work, and identify at-risk initiatives early. Agile project management, budgeting, collaboration, video conferencing, team business chat, mobile collaboration. Great resource management tools, such as a workload chart. Very intuitive and user-friendly design. Unlimited workspaces – unlimited storage space and projects . If you are searching for a leading project planning software in the industry, Clarizen has it all. The system includes all of the specific planning features including the ability to support Agile and Waterfall methodologies and also customized processes. It is among the top project management solutions that merge the power of the cloud with social communications to provide real-time updates, insights, and collaboration. You have an excellent overview of the project so you can move faster. Fantastic Gantt chart representation and good Project Report with basic project information, roadmap, details on milestones, tasks (completed, active and tasks at risk or off/track), risks, requests, issues, bugs and timesheet reports. Clarizen can definitely be considered as a complete package for planning and project management. resource planning, collaboration, financial management and anything else needed for advanced project management. Very easy planning and scheduling. Emphasis on team collaboration and task management. Valuable financial management tools in addition to all the other PM features. The software integrates easily with many popular applications – Microsoft, Salesforce, JIRA , Google, Zendesk and more. A cloud-based solution for managing the entire project delivery lifecycle. Quick to set up with a very business-professional interface. You could see impacts to your Gantt chart and project budget the moment a delivery date shifts or your resources change. If you need a project planning software with a high level of collaboration between teams despite geographical boundaries, you can consider Project Place. All-in-one system for the entire team, from the project manager to each member of the team. Combine in a great way Gantt, document management, Kanban, online meetings, and social features. Your team is able to create plans, organize their work, and track personal tasks. Meet your commitments with personal to-do lists. An excellent view of the overall process, composition, workflow, and progress of projects. Gantt-like timelines that helps track the steps and schedule. Great resource management and action planning. When it comes to modern and smart project planning software and tools, Hub Planner has a lot to show. Online resource management software – a complete solution for small, medium and enterprise-level business. Visual scheduling software with timesheets and powerful reports to plan your resources. Includes Resource Scheduling, Timesheets, Project Planning, Approval & Dynamic Reporting. Allows you to schedule and book your people and projects on a calendar-type grid, presenting you with the big picture of what your team of resources are working on and when. The main features of Hub Planner can be broken up into the following components: Schedule and Plan, Time Sheets, Reports, Management. Hub Planner is built with the modern project manager, resource planner, and CEO in mind. 1000ft is a web-based high-level resource planning tool and project management application. You can communicate your work with clients and stakeholders in a simple way. The software focuses on the big picture of a company’s projects. You easily see who works on what, spot blocks of availability, and adjust assignments on the fly. 1000ft make resource management easy by creating an interactive schedule with a dynamic timeline that visualizes the work plan for your entire organization. Flexible planning interface with drag and drop features, resource planning templates. The platform is able to give the most important information that helps entrepreneurs to make better decisions about their business. Planplex has been built from the ground up for instant sharing and synchronization, providing per-task instant messaging, collaborative project editing, and integrated project wikis. An online project planning tool that helps you to plan, estimate, track progress and stay in touch with the members of your team. You can quickly create a project plan with easy and fast data entry. You are able to have your project under control at all times. Seamless planning and estimation of per-task dates, duration, effort and progress. Flexible calendars definition, Task dependencies, and Milestones. Project Tracking – all the tools you need to track it: activity accounting per resource and task, auditing of activity records, integration of daily effort into your plan’s estimation, and a project status dashboard. Focus on monitoring projects, budget, and resources. You are able to track project evolution in terms of completion, time and costs. You can break down your project, build schedules, allocate resources and manage budgets. The software integrates with Microsoft Project and Excel. The platform quickly identify issues and potential problems that might hamper a project’s progress. Very easy to use with intuitive design. Works everywhere: Windows, Mac OS X, Linux. An open source project planning software set for project teams. When integrated with the 2-plan Desktop, it enables teams to do both project planning and project execution. Handle multiple projects and multiple teams and tap on the power of a database engine. 2-plan Team is available in several languages. The software provides many modules for business owners to track and manage all aspects of their business. Simple and efficient PM tool sets for notebooks, handhelds, iPhones, Androids, networks and the web. 2-plan is the a balanced corporate and small business project management system for project managers, one team projects, and multiple teams. One of the most popular and best free and open source project planning software. You can choose if to use Bitrix24 in self-host on the company’s own server or in the cloud. Bitrix24 offers layered task options, Gantt charts, time tracking, and management, document sharing, employee workload planning and more. Free and premium version available. The free one is very powerful. You can use Bitrix24 in your office, or anywhere you like with the free mobile app! Some of the features included in free option are: unlimited users, enterprise social network, collaboration by email, group chat, video conferencing, unlimited tasks and subtasks, unlimited projects, daily planner, reports, task templates, time tracking, workload planning, calendars – personal and shared and more. When it comes to free CRM and planning software, Bitrix definitely is one of the top. All the team members can take part in the planning and this makes possible to have a real-time planning. If you need to manage more than one project at a time, with resources that participate in several projects, LibrePlan is design thinking of these scenarios where multiple projects and resources interact to carry out the work inside a company. A project planning tool with support for resource allocation, task management, tracking, Gantt charts, and much more. One of the top software and tools for project planning. How to choose the best planning project software? Quick Tips. As we mentioned in the beginning of this page, project planning software is nothing more that a PM system with an accent to planning. Scheduling – you know that scheduling is an absolutely critical component when it comes to planning. If you running a large team make sure the scheduling option allows many people to work together on the same schedule. Gantt charts – a must component of planning and scheduling. Gantt chart provides you with an overview of the project progress through a visual timeline. The Gantt-chart feature allows you to see dependencies of various tasks within a project, to compare planned items versus actual results, monitor deliverables, and more. Automation Project Planning. Automation can save hours of your time by dramatically simplifying project planning. The majority automated solutions are priority-based and you can easily schedule your projects just by defining priorities and assigning tasks. Your project plan is calculated automatically. Task Deadline Alerts. Almost any PM software has some notifications. But you check carefully if the system is able to instantly notified you when your tasks are behind the schedule. This is a vital planning feature too. Resource planning – this option allows you to manage your resources accurately. It shows you day-to-day availability of your team. You know who’s working on what and when it will be finished. No unpleasant surprises that disturb the planning. Integration with tools you already use. Check if the system provides an integration with all other software you use. It is an important time-saver for you. Milestone charts – the software should provide an option for managing milestones. They are tools to mark specific points along a project. This will help for sharing high-level project information. Predictive Features. When it comes to planning, dynamic and changing circumstances can be a real disaster for a project. Missed deadlines, unhappy stakeholders, and etc. are common problems especially if you do not have the right PM tool. Predictive features in a PM software can give you reliability for а successful project ending. If you are serious about planning and if your company size requires extensive planning, make sure the software provide advanced statistical calculations to measure the impact of project changes. This will allow you to deal with changes quickly wich is a crucial point for the success of your project. On the market, there is a huge range of PM tools and systems. If your goal is to find the best project planning software think carefully about: what are your planning needs and gaps, how large are your projects, how many people will be working on the projects, do you need mobile and online access and etc. Only after you have the right answer of these questions, start searching for a software and tools, because the good planning is what brings success to your projects and your work. 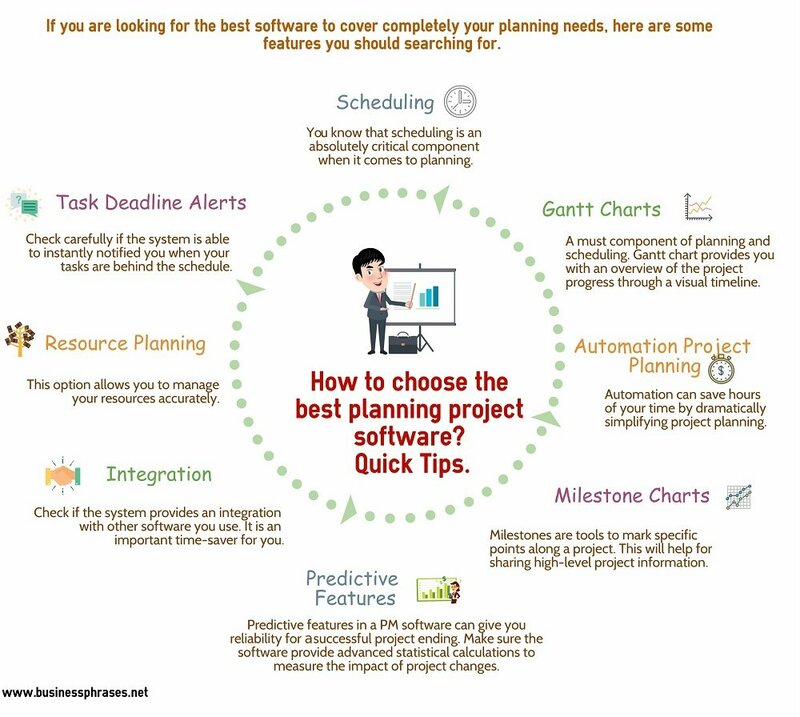 Download the next Infographic (Project Planning Software Tips) in PDF for free.